Tie Dye on a sandy beach combines quintessential summer fun with easy clean up. The most successful way of dyeing is using plastic bottles with a small spout. Rather than dipping into a bucket of dye, this allows you to pour colors directly on the cloth. The images above display a variety of folding techniques such as striped, bulls eye and spiral. Dyeing can be pretty messy so be sure to dress in old clothes and always where latex gloves as the dye takes a few days to wash completely from your hands. 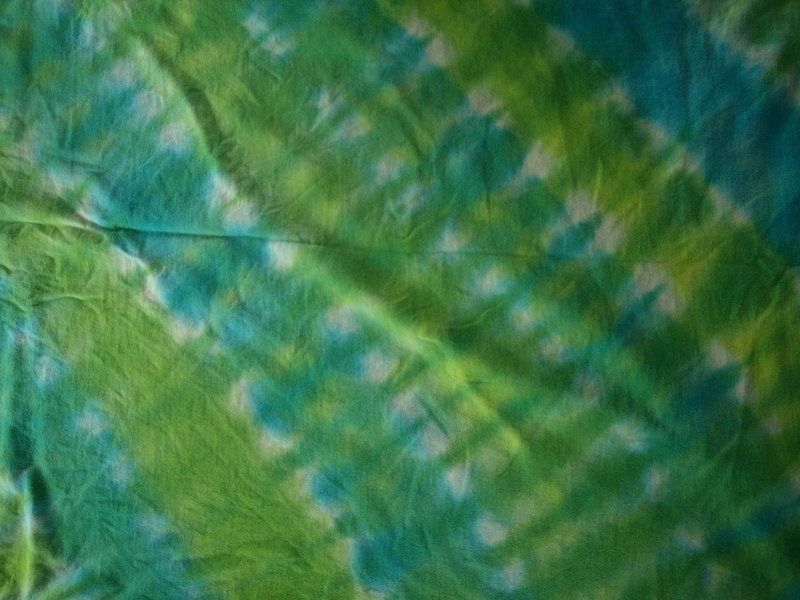 Dharma Trading offers very helpful tie dye kits that include all the materials necessary for hosting a dyeing event. The set also includes a descriptive booklet on folding techniques. Below I have posted my recipes for mixing vibrant colors using just magenta, yellow and turquoise (the colors offered in the tye-die kit). 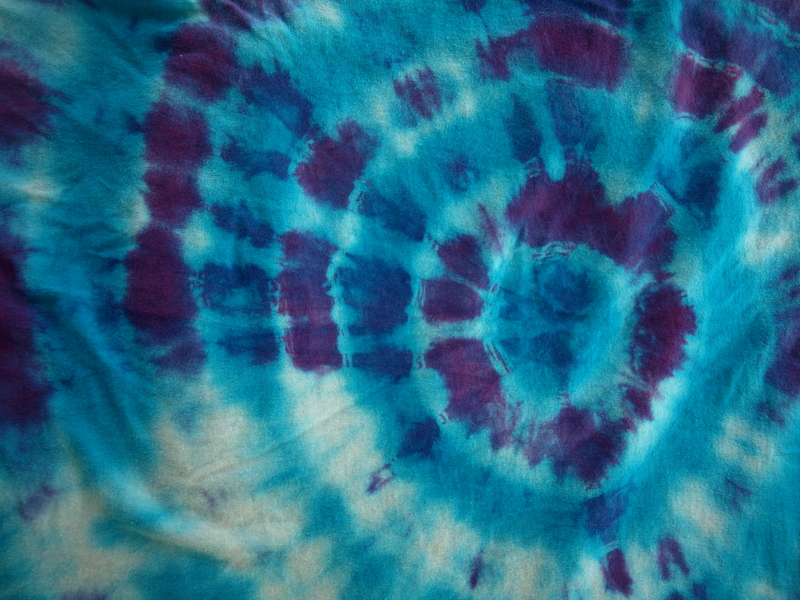 If you practice tie dye frequently, you will accumulate and big supply of hardware and, in the future, will only need to purchase the dye and a few other chemicals for mixing and soaking clothing and of course, rubber bands. I have saved and reused rubber bands in the past but find that they loose their strength over time and it is best to replenish your supply with a new pack. Dye kits and some really sassy white clothing. Some items you will need to purchase that are not included in a tie dye kit: plastic table cloths, 5 gallon bucket, paper towels or rags, sharpie markers for writing names, latex gloves. 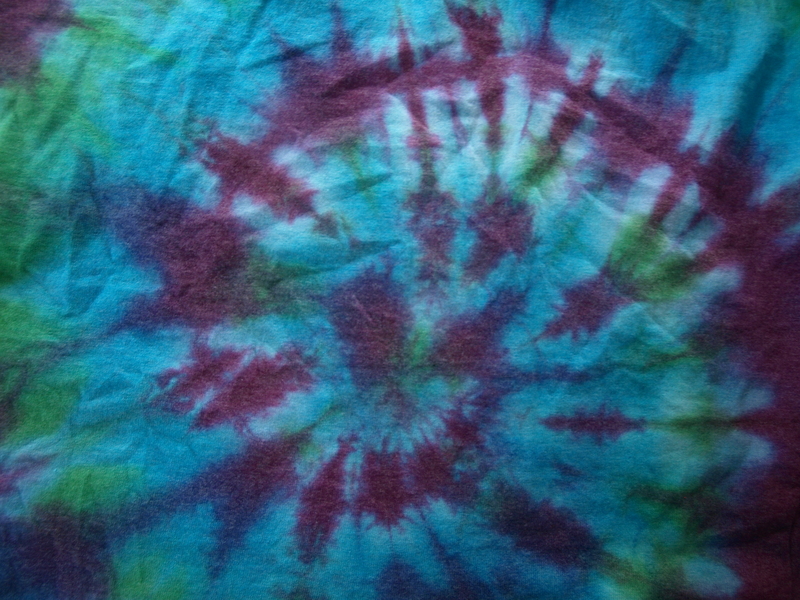 So….when is your next tie dye fest? Oh, gee. It was two weeks back. Would you fashion a t-shirt? If so I will make you one, just let me know your color choices. What is the name of the pattern in the bottom right? It looks sortof like a bull’s eye, but it isn’t quite the same. Was it folded in triangles? You hit the bullseye! That’s it. I repeated a pattern of turquoise and purple after tying. I’ve been trying to find the name of a pattern that’s popular in stores right now….it doesn’t go throughout the whole fabric, but in stripes, where it almost looks like scales/snake skin? This one seemed reminiscent of it. Would you happen to know the name of that pattern?